Twin Cities Ballet presents our 37th Annual Production of The Nutcracker on Friday, November 30, 2018- Two school performances at 10:00 and 12:30. Two Public performances on Saturday, December 1st and Sunday December 2, 2018 at 2:00pm at ISU Braden Auditorium. Each year, we proudly offer both public performances and matinees geared for school-aged students of this classical ballet. Public Performance tickets go on sale October 1st. 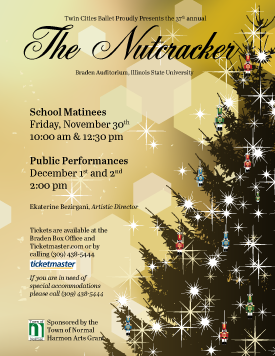 Please call ISU Braden Box office 309-438-5444. To avoid extra fees it is best to call or stop by the box office. Rehearsal start In October 6th- Please make every attempt to be at rehearsal and please call the studio if your child is ill or absent. Missing more than 2 rehearsals may jeopardize their involvement. Starting Saturday, October 27th , November 3, 10, 17 we will rehearse from 1-3:30- Full Cast rehearsal. Mice and soldiers should arrive by 1:30pm.